Junior point guard Kellen Kenney had a game-high 23 points, six assists, five rebounds and five steals to lead Fennimore to a 62–59 SWAL victory at Mineral Point last Thursday night. POSTED January 31, 2019 2:14 p.m. 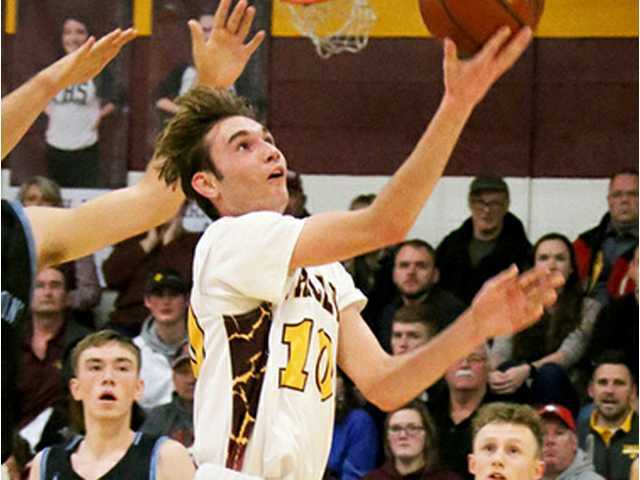 Junior Kellen Kenney had another fantastic all-around game, finishing with a game-high 23 points, six assists, five rebounds and five steals to lead Fennimore to a 62–59 SWAL victory over rival and 10th-ranked Mineral Point last Thursday night. Kenney’s steady play was even more important in Thursday’s victory considering, the Golden Eagles (13–2, 6–2 SWAL) played the entire second half without leading scorer and senior captain Reid Larson, who was benched for picking up a technical foul with 1:07 left in the first half. With 1:07 left in the first half, Fennimore senior captain and leading scorer Reid Larson was hit with a technical foul. Coach Larson — also Reid’s father — has a hard an fast rule on his team; you get a technical foul, you take a seat for the rest of the night. And coach Larson made no exceptions, not for his son, not even in the “big” game. Kenney also 17 points, 11 assists and seven rebounds before taking a seat with six minutes left in Fennimore’s 77–64 victory at Iowa–Grant on Saturday. The Golden Eagles led by as many as 25 in the second half. Kenney and the Golden Eagles return to action Friday night in a SWAL showdown at first-place and undefeated Darlington (14–0, 8–0), which is currently ranked second in Division 4. Adkins finished with a game-high 16 points, seven rebounds and four blocks, including a key swat with 25 seconds left in a one-point game, to lead the Fennimore girls (5–11, 2–7 SWAL) to 53–52 upset of SWAL co-leading Cuba City (11–4, 7–2) last Friday night. Ahnen scored a dramatic overtime pin over Kyle Vondra at 182 pounds during Friday night’s SWAL dual with rival Mineral Point. Ahnen’s victory gave the Golden Eagle (7–0, 6–0 SWAL) its first lead of the night at 24–22 and helped propel Fennimore to a 40–22 victory that clinched the program’s fifth straight SWAL duals wrestling title. Kartman finished with a game-high 16 points and 14 rebounds, her sixth double–double in her last seven games, to lead the Potosi/Cassville co-op to a 51–41 win over Fennimore. She also had 10 points and 11 rebounds in last Monday’s 60–47 loss at Argyle (11-2). Kartman is averaging 10.3 points and team-high 9 rebounds per game (both second on the team), including 13.3 points and 11.1 boards over the past seven games. The Chieftains (9–5) are 5–2 during that stretch. Liddicoat scored 21 of her career-high 32 points in the first half to lead the Iowa–Grant girls to a 57–44 victory at Boscobel last Friday night, the Panthers’ (6–11, 2–7) in league play. Liddicoat made 10 of 16 shots from the field, including 5 of 7 from 3-point land. Willborn made four 3-pointers and scored a career-high 16 points to help the Belmont girls defeated Juda 52–28 last Saturday for the Braves’ first win of the season. The victory snapped Belmont’s (1–13) 14-game losing streak that dated back to last year. Wedig scored 10 of his 12 points in the second half and overtime to help the Belmont boys edge host Juda 73–69 in four overtimes Friday night in a Six Rivers Challenge crossover game. Wedig went 8 of 10 from the foul line, including four straight in the final minute of the fourth extra session.